Even though I recently made two coffee cakes, I just had to make this one for a friend who was giddy with excitement about winning an all-expense paid trip to Budapest next month. This recipe is from a c. 1973 book confidently entitled A Collection of the VERY FINEST RECIPES ever assembled into one Cookbook. And this coffee cake is extraordinarily delicious, which is a good thing on account of all the butter and sour cream in the recipe, along with the rather complicated instructions, for this cake has layers of cake batter and nut filling. 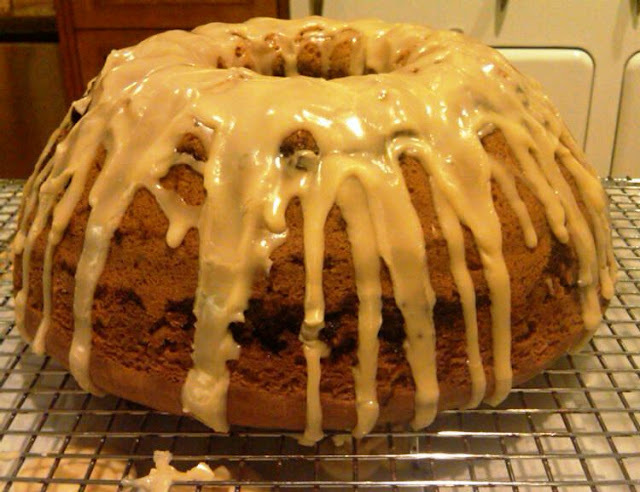 Many coffee cake recipes instruct that the nut mixture just be sprinkled over the top of the cake. Unfortunately, it was so good that my friend single-handedly ate half of the cake in about ten minutes and now he can't fit into his Speedo for the swimsuit competition in Budapest. But as an avid reader of my blog, he'd be the first to say, it was worth it. 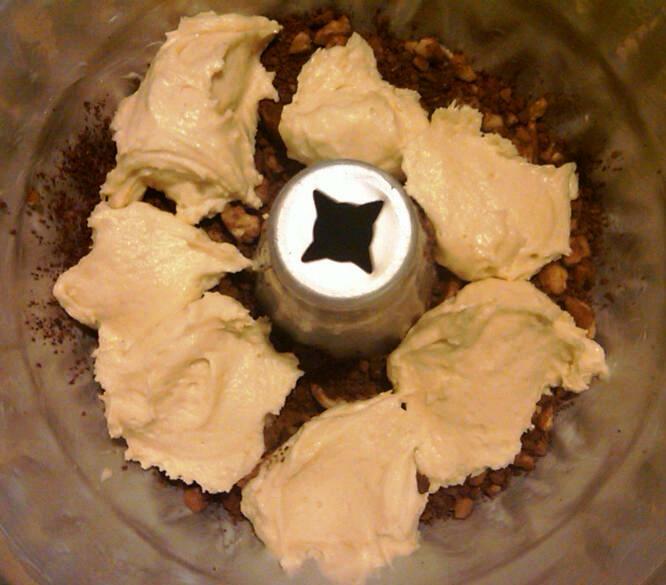 Creating the layers by alternating the nut mixture and the batter was a challenge. 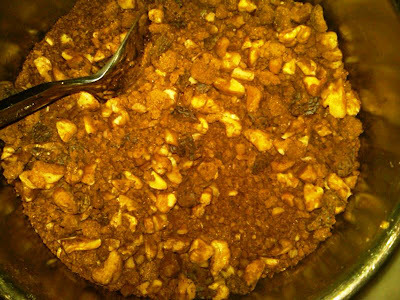 This nut mixture had an unusual flavor note, because in addition to usual suspects, it called for cocoa powder. Layers in place, fingers crossed, the cake is ready for the oven. This looks like my dream cake! So moist looking, sour cream cake with nuts is my favorite. I don't like glazes like that, wonder if you could drizzle chocolate over it instead. Any other ideas? I will see if mr. wonderful will make this for my birthday! 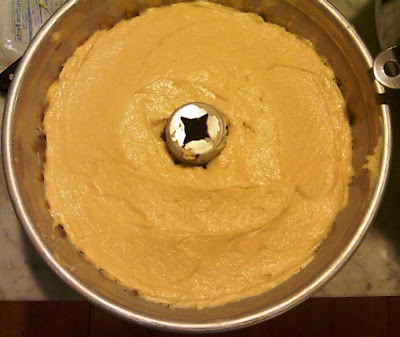 Though the layers look beautiful, I wonder what would have happened if the nut filling and batter had been combined together and then placed in the bundt pan? My mom's "sunday best" sour cream coffee cake calls for similar layers (except sans nuts) and, out of laziness, she often mixed everything together, producing an evenly spiced, warm-brown-colored crumb. @Margaret: Chocolate would be lovely on top! 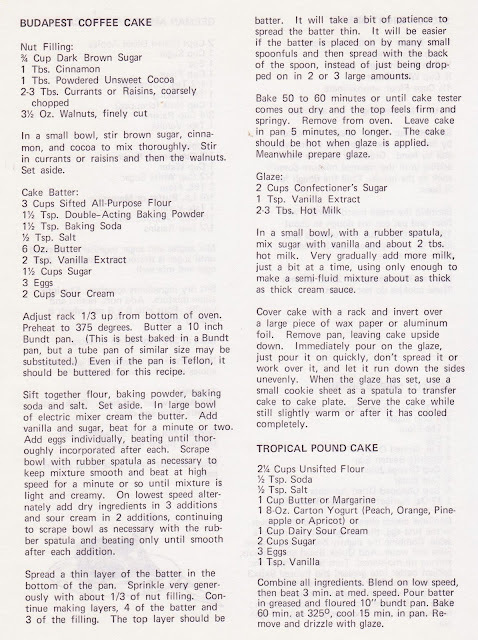 The cake is not very sweet, and it's the job of the glaze to add sweetness. Let me know if Mr. Wonderful comes through! @jkelliott: I'll bet it would be great and a lot easier to fold the filling into the batter. There´s a Maida Heatter book, originally printed in 1965, that has this same recipe, and she says she´s been offered a marriage proposal because of it! I´ve been making it for a year now and it´s probably my favorite one. Great layers! It´s not easy to achieve them! I love Maida Heatter and had no idea that the recipe was hers. Thanks for the heads up. And I can totally understand how this cake could conjure up a marriage proposal. Thanks for writing and happy baking. This is one cake I don't know if I'd try again (so I admire you) -- it's a lot of work! 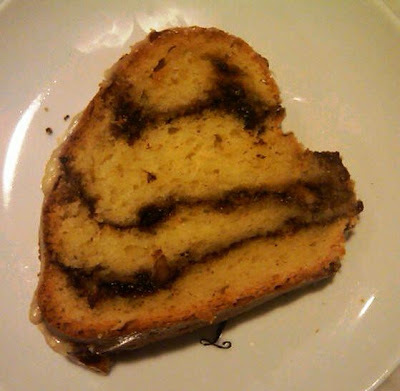 Susan, yesterday I posted about a coffee cake with figs, and I linked to this post. Have a great week! Thanks so much, Paula. I am in awe of you -- you post (cook/bake) so frequently, have "another side of you," run a cafe, and have a gorgeous, well-written creative blog. And I can't even answer my comments in a timely manner ; )). A Cake Bakes Makes the 2010 Park Slope 100 List! Pecan Crispies -- The Atlantis of Cookies? You Hoo, Mrs. Goldberg. Want Some Coffee Cake?